There are a couple things I learned to love only when I had them while living abroad. One is a persimmon and another is daikon. I can’t abide red radishes. Never have been able to stomach them. I don’t know if the Japanese white radish is more mild, but it is definitely one of my favorite things. I snatched up a couple when I saw them on sale at my local Kroger (yowzas! how international!) and decided I need to do something with them. Here’s the scoop on daikon. We froze a lot of the leftover ham from Christmas, so I pulled out some of it and decided to make some soup! 1. In a large saucepan, mix the water, potatoes, carrots, daikon, onions, salt and pepper. Bring to a boil. Reduce heat and simmer 30 minutes, or until vegetables are tender. You should probably leave the pan uncovered. I thought there might be a mistake, so I put the cover on it. When I was about to do step#4, I realized that my soup was going to be too watery, so I ladled some of it out. With the pan uncovered during this step, the water will evaporate out of the pan and leave you with the right amount of broth. 2. Mix the ham into the vegetable mixture. When I cubed the leftover ham, I included some of the bits of fat. It just adds the right kind of flavor to the broth while the vegetables are stewing, but you can prep it as you wish. I left the soup on the heat while I worked step #3. 3. In a medium saucepan, melt the butter. Stir in the flour until smooth. Slowly pour in the milk. Bring to a boil. Cook and stir 2 minutes, or until thickened. stir in the Cheddar cheese until melted. 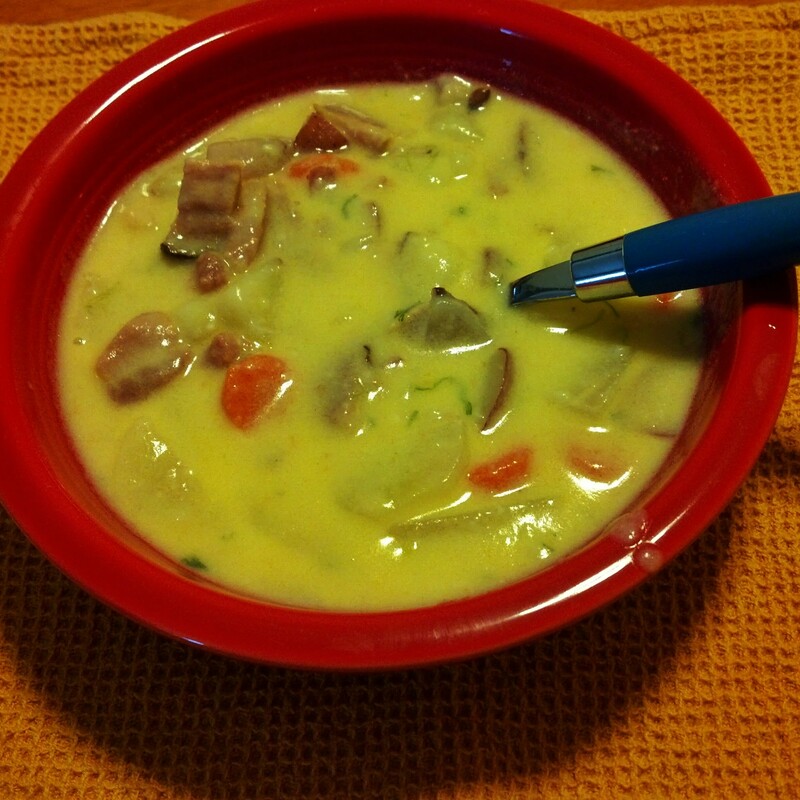 This is the first time I’ve made a cheesey soup and I was amazed at how it turned out. Trust me, I would not have thought to add flour. The key is to watch it fairly constantly. You should work on this step once you have the veggies and ham done. 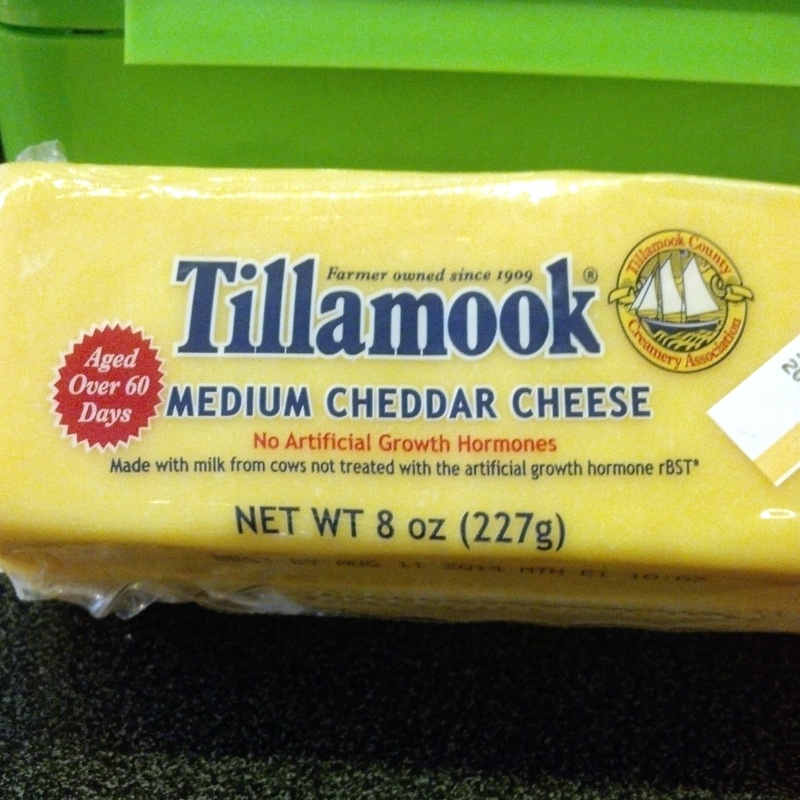 I’ve been using Tillamook cheese recently and I love the flavor, consistency, and that it comes from cows not given artificial growth hormones. I have yet to cut myself while shredding it, so that’s always a plus. 4. Mix the cheese mixture with the rest of the soup and serve. Makes 8 servings. This soup was a big hit with the Huz. We have some more ham leftover, so I might have to make another batch before the end of the month. We had a massive cold snap (like the rest of northern USA and Canada) and the soup warmed us right up! Sometimes even the smell of bread baking in a house can warm up the place. During the -10*F weather we had earlier this week, that was just what I needed. I’ve become disenchanted with white bread bought in a store. I recently watched a video about this compound called azodicarbonamide. It’s a compound used to bleach flour in the US. It’s also found in foamed plastics…like yoga mats. Yum! It’s banned in Europe and Australia and has been thought to increase propensity for asthma. Check it out in your favorite breads’ ingredient lists – even the ones that say whole wheat bread. The only ones I’ve found so far that don’t have this compound in it are potato bread and Nature’s Own butter buns. So I decided to make my own, take control of what we are putting in our bodies. 1. In a large bowl, dissolve sugar in warm water. Stir in the yeast. Depending on how old your yeast is, you might try to proof it first before mixing in the rest of the ingredients. Proofing is where you let the yeast foam up a bit, about 2 minutes. If it doesn’t, then the yeast might be too old. For fresh packets of yeast, go right ahead with the recipe. It’s best to use the yeast as quick as possible. 2. Mix salt and oil into yeast mixture. Add flour one cup at a time. I hand mix the flour at first and then use a dough hook with my mixer when it gets too hard to mix myself. Let the mixer go for a while, until the dough is balled up around the hook. It might still be a little sticky. 3. Knead dough on a lightly floured surface until smooth. Dough should be smooth and not sticky. Place in a well-oiled bowl, and turn dough to coat. Rub butter on the inside of a bowl that’s bigger than the doughball. Roll the dough around enough to coat the whole thing with butter. Cover the bowl with a damp cloth and set in a warm place to rise for one hour. The doughball should be twice its original side. 4. Punch dough down. Knead for a few minutes, divide in half (if making two loaves). Shape into loaves, please into a well-oiled 9×5 in loaf pan(s). Allow to rise for 30 mins or until 1 in above pans. I asked my mom if there was a a secret to getting the bread smooth on the top and she suggested using a rolling pin to roll out the dough, getting rid of all the air bubbles. Then, roll up the dough, one end to the other, tucking in the edges as you go. When you get to the end, press the seam into the rest of the dough and set it into the pan, seam-side down. Rub the top of the dough with butter. 5. Bake at 350*F for 30 minutes. 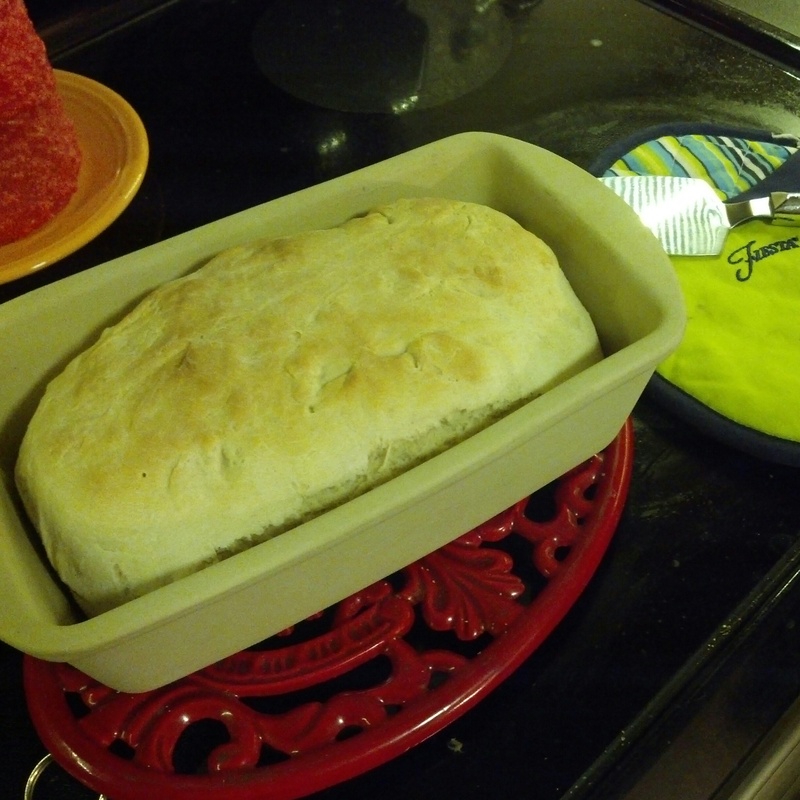 I have a stoneware loaf pan and it makes the bread so nice and brown all around. And the bread never sticks to the pan, I would highly recommend using one. This entry was posted in Making Home, Recipes. Bookmark the permalink.